Ryn Gargulinski is a writer, artist and performer whose journalism career began in 1991. Credits include two illustrated books, "Bony Yoga" and "Rats Incredible." She holds a Master of Arts in English literature and folklore and a Bachelor of Fine Arts in creative writing with a French minor from Brooklyn College. What Shoes Do You Need for Distance Track & Field Running? When it comes to treadmills, size does matter. You want a treadmill that suits your height and supports your weight. If you’re going for a home gym, you also want one that will fit in your available space – and through your doorways so you can get it in the house. Treadmill lengths can range from 54 to 62 inches. The width generally increases with respect to the length, with the widest decks measuring around 22 inches. While treadmill specifications generally list the deck length and width, ACE Fitness says to base your buying decision on the size of the belt, opting for one that is at least 49 inches long and 17 inches wide. Fitness magazine notes a 54-inch machine is adequate if you are under 6-feet, 2-inches tall. If you top that height, it says to go for a deck that is at least 58 inches long. Although the deck measurements give you the size of the running surface, they do not necessarily reflect the size of the assembled treadmill. You need to account for the size of the motor and its housing at the front of the machine as well as the size of the overall frame. A treadmill with a 22-inch by 62-inch deck, for example, can have an assembled size of 82 inches long, 32 inches wide and 56 inches high. Manual treadmills are the smallest of the lot, with a deck that can be as small as 42 inches long and 13 inches wide. Manual treadmills generally have a small, lighter frame and lack the space-eating motor and motor housing. Treadmills can fold up to save space when they are not in use, but remember you will still need room to unfold them to use them. The motor size matters, too. Treadmill motors are gauged by horsepower and rated by either continuous or maximum capacity. Because you will be using the treadmill for an extended period of time, opt for a horsepower based on continuous, rather than maximum, power. ACE Fitness recommends a motor with a minimum of 2 continuous-duty horsepower while Fitness magazine says not to dip below 2.5 continuous horsepower. The size of the motor as well as the size and construction of the frame play a part in the treadmill’s capacity. ACE Fitness notes the 2 continuous-duty horsepower motor can accommodate weights up to 180 lbs. If you weigh more than that, go for a higher horsepower. Also check the overall capacity, usually listed in the treadmill’s specifications. 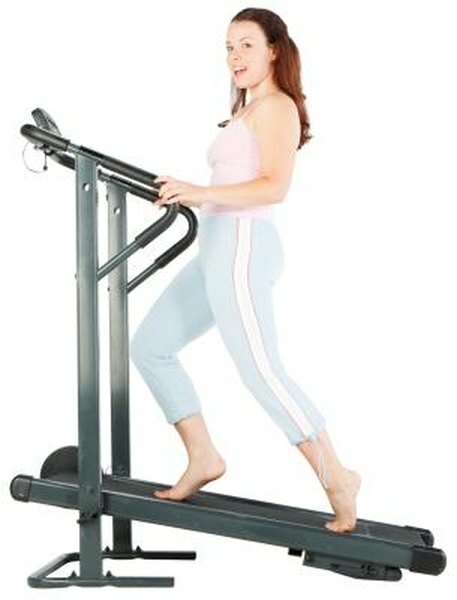 The smaller manual treadmill, for instance, can support up to 220 lbs. while the treadmill with the 22- by 62-inch deck can support up to 500 lbs. A treadmill generally needs at least 30 square feet of floor space, ACE Fitness says. This is the same amount of space you would need for an elliptical trainer, but more space than some other home fitness equipment. A ski machine needs about 25 square feet, a rowing machine and needs about 20 square feet and 10 square feet can be sufficient for a stationary bicycle. Stair climbers need between 10 and 20 square feet. This article reflects the views of the writer and does not necessarily reflect the views of Jillian Michaels or JillianMichaels.com. How Should Gym Equipment Be Arranged in a Fitness Center? How Long Should You Jump Rope Each Day? Find answers to your questions in our help section or contact our customer service team, who are available Monday-Friday 9AM - 5PM EST. JillianMichaels.com Copyright © 2016 EM Digital LLC, a subsidiary of Empowered Media LLC. All Rights Reserved.